I am weary of winter—and I’m not alone! Thanks to polar vortexes, joy has been in short supply this season! Even those of us who normally enjoy the unique gifts of winter have had enough of snow and ice and wind and way below zero temperatures. 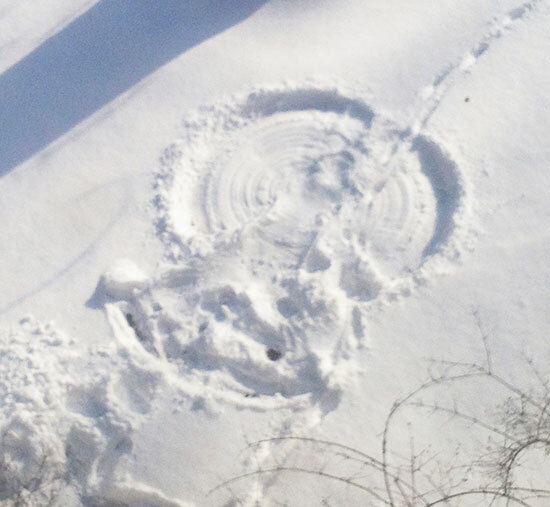 How naïve, I think now, looking back to December 9, 2013—when I rewarded myself for shoveling with a snow angel! Like most people in Chicago, I’ve spent the worst winter on record hunkered down indoors as much as possible. To venture out is to first spend an inordinate amount of time layering up to protect against the very real danger of frostbite! No long walks by the lake for me! My cross-country skis languish on the back porch because I’m far too thin-blooded to brave frigid temperatures for the joy of skiing. I’m locked in polar misery. Saturday morning, it was a balmy 19 degrees when I drove to my Zumba class and joined a gathering of other die-hard Zumba-fanatics. In the midst of this crazy winter, those of us showing up for Suzy’s class enjoy an immediate sense of camaraderie. And Saturday, one of the women was celebrating her birthday, so Suzy had created a special playlist of her favorite songs. It felt like a party. And, moving my body to the music in the company of thirty other laughing, dancing, sweaty women—I felt joy. Truthfully, we all yearn for joy—the most complicated and least understood of the eight basic emotions. What we know is that joy is a primal emotion. Our brains are hard-wired to experience it from birth—look at all the internet videos with laughing babies! Physiologically, the experience of joy delivers an adrenaline rush—like a runner’s high. Joy is the experience of really being alive and aware with all our senses. When we feel connected to another—or something greater than ourselves—joy can be experienced as spiritual. The feeling of joy is as addictive as it is elusive. Joy is the jackpot of emotions! We all know the jumping-up-and-down exuberant joy when something we’ve longed for actually happens, or when surprised by a positive experience—but sometimes joy comes in the quiet realization that there is nowhere else we would rather be. There are many definitions for joy—but no surefire recipes. The harder we try to create joy, the more likely it is to elude us. We seek joy, but most times it arrives unbidden. The secret to feeling joy more often is to combine as many key ingredients as possible, and hope that alchemy does the rest! Think about the times in your life when you were aware of being joyful at the moment you felt it. When there was a pinnacle of joy. It wasn’t in reflection, it was in the moment. Write those times down. Don’t feel bad if there are only a few. Be grateful there are any. Write down all your happiest moments! Deconstruct them to discover the various factors involved. List the factors that were common to your experiences. Mindfully create occasions in your life that incorporate as many factors as possible. Be in the moment and surrender to the experience! I’m with a person I love and trust. The location is outside my norm. I’m engaged in a challenging (but not impossible!) physical activity. All my senses are engaged. And I am present in the moment. Obviously, I can’t always be mountain climbing in a foreign country with someone I love who makes me laugh, but I can make choices! In the summer, I can go outside and ride my bike harder, faster, and farther than usual. In a normal winter, I can go cross-country skiing along the shores of Lake Michigan. Better yet, I can do it with a friend with whom I laugh. This winter, I can go to Zumba! Most important, when I do anything, I can mindfully engage my senses and be present in my body. Each of us carries within us a compass that can lead us to happiness—even joy—if we only learn to read it. And it is our responsibility to build into our lives those things we can that make us happy. Even when we put all our factors in place, there is no guarantee that joy will show up. But there is a greater likelihood. And, at the very least, we’ve set the stage for happiness! We owe it to ourselves and those we love to do just that. Excellent read and reminder! Thank you!